Master bedroom en suite with twin beds & air-conditioning. 1 twin bedroom (can be used as a second double) with air conditoning. Well equipped kitchen with dishwasher, and microwave, etc. Lounge 2 sofas, dining room with with oval table for 8. Automatic gas heating throughout. Small fish pond below patio. There are large patios at the front and side of the house with built-in barbecue and all rooms have beautiful views of the countryside and the sea. Woodburner for cooler winter evenings, as well as balanced-flu gas heaters in each room. Nestling into the brow of the foothills of Sao Miguel with panoramic sea views, mature gardens and a large 60 square metre (10m x 5m) shared pool with the 2 other villas, this ancient paradise of farmhouses, amid rambling gardens, have been lovingly restored to retain their rustic Algarvean charm. At the same time each villa provides every modern amenity including a fully equipped kitchen, satellite TV. & Internet. We also provide 24 hour service when needed. Monte Velho (traditionally meaning an old community) offers an ideal retreat in the sun yet close to all amenities, bars and restaurants and the gorgeous sandy coastline with numerous unspoilt beaches. All bedrooms are air-conditioned. And all have wood burners. All have spectacular views. Casa Maria has a split-level lounge/dining room, with attractive vaulted ceiling, consisting of cane, & pine beams. The rooms are spacious. It is the largest of the 3 Casas. There is ample shaded parking in the back. And a large 300 year old carob tree shading the front patio. 3-day minimum. Casa Helena, next door, is spacious, open-plan with original fireplace. The master bedroom has been recently renovated & bathroom added. It has large patios, & parking on the side under an olive tree. Casa Catarina is detached, with 2nd bedroom in an Annex, 3m from casa. It is the smalles, & most private. Parking is on a large Eira (threshing ring). Bitte mailen Sie mir direkt: mary.montevelho at gmail.com. .
We bought our Eastern Algarve property because this is still a peaceful, rustic area with friendly people. And we have superb views of the Atlantic Ocean and the countryside. Our guests enjoy the many country and seaside walks, so near at hand. It is not remote, only 5 miles from the Atlantic Ocean and 2 miles from the friendly village of Moncarapacho. We enjoy a micro climate, no frost and little rain. The Eastern Algarve is Europe's best kept secret! Peace and tranquility, a chance to totally unwind. And the joy & thrill of discovering another world. Both have walk-in shower stalls. Air conditioning in both bedrooms. Good cross-ventilation in lounge & dining room. 2 fans. Balanced flue gas heating in lounge. Bedrooms have ac/heater units. At side of house in shade of the Olive tree. Also pool towels are provided Please don't use bronzing lotions, as they stain towels, linen, as well as your clothing. Large wood burner. Logs on request. everything you could want. Please ask for if you wish something special. Fully equipped. One guest said it was better equipped than her own kitchen! Lovely pine oval table for 8 or 9. Mary has more books, non-fiction, which she is happy to lend. These can be let at local shop, Moncarpacho. There are many excellent golf courses nearby. Colina da Verde is a 9 hole golf course, 2 miles east of Moncarapacho. Very pleasant staff & reasonable. 18 hole golf courses are in Cabanas, 20 mins east. Pool is shared by 2 other Casas. There are 12 lounges, 4 tables w/chairs, 3 umbrellas, 2 hammocks under a large carob tree.. Covered & partially solar heated in winter. Notes on accommodation: All villas have AC/heaters in bedrooms, balanced-flu gas heaters, TV with BBC and digital satellite, and DVD players. All villas are private with private patios and parking. Summer week lets start on Saturday, for minimum of 1 week. Three-day let minimun off-season. Excellent villa management at your service 24/7. Outside: Set on 5-acre (2 hecters) hilltop with sea views, with abundant terraced gardens, backed by San Miquel mountain. It is possible to get away from it all & relax completely at Monte Velho in a peaceful atmosphere. Each house has private patios & private parking. The pool is 10x5 1/2m. Copious patio furniture on each patio & pool, including 3 hammocks under a large carob tree. A ladies holiday to remember! My friends and and I often, once or twice a year, plan short holidays to celebrate our “special” birthdays. We’ve been many places including Spain, Budepest, Italy, New York and Iceland but none has captured the holiday/homy feel as did our stay at Monte Velho. Aside from the beautiful weather and view, we were greeted with a warm and friendly welcome! Each day offered us opportunities to explore the surrounding areas, including gorgeous beaches and market towns, or just chill out by the pool indulging in sangrias and home prepared meals by one or more Of our group. All and all we all managed to agree one one thing and that is that our holiday here at Monte Velho was probably one of the best if not the best holiday we’ve been on as a group! It is heart-warming to know how much you & your friends enjoyed Monte Velho. A place you'll definitely want to return to again! 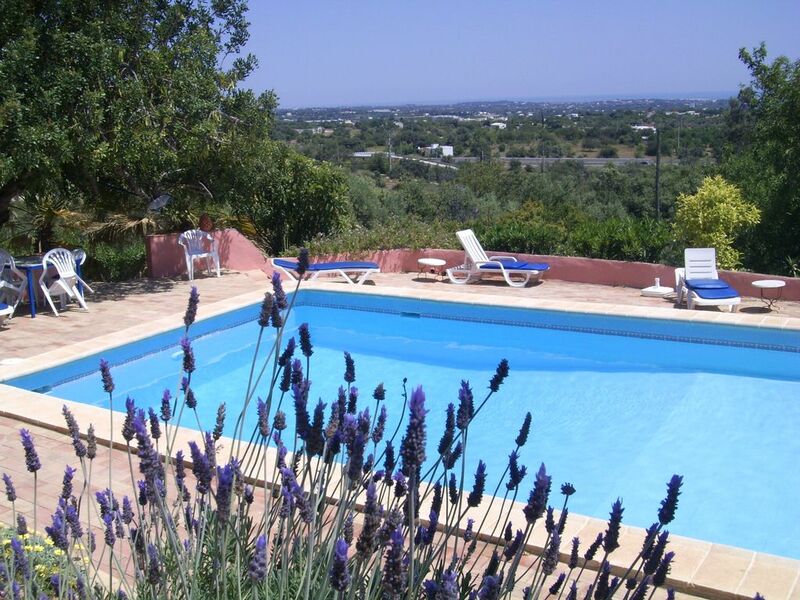 We have regularly stayed at Monte Velho for a number of years, that in itself speaks volumes not only for the property but for Mary and Bill who are excellent hosts, always on hand should you need them but in no way intrusive. These days it's just my wife and I so we always stay in Casa Catarina which is ideal for two but has the option of a second bedroom should we manage to pursuade our "kids" to come to. The overall property provides magnificent views out to the coast , with the gardens providing a perfect setting for the pool. This truly is a retreat and an ideal place to relax, soak up the sun or dip in that pool. The Casa whilst being equipped with everything you need has a rustic charm that is very endearing. You can only love this place. Each Casa has it's own patio for sunbathing and eating al fresco. You could'nt ask for more! Moncarapacho is just a few minutes drive and provides food shopping, the usual village market and a number of restaurants. Two of which are located in the square, a perfect place to unwind in the evening after a day at the beach or just playing tourist. The beaches in the east of Algarve are amazing, flat beautiful and go on for ever, you are never going to get crowds here. Take a ferry trip out to one of the islands off Fuseta and you won't be disappointed. The whole coast line is ripe for exploring. Don't miss Praia do Barril and Praia de Cabanas which is on the east side of Tavira. This year 2019 we hope to explore the coastal lagoons and attempt some bird watching. How lovely to have your beautiful review. We are so happy to know how much you enjoy Monte Velho. We just ended our 2nd stay with Mary & Bill & family at Monte Velho, and we are already planning a return trip. The villas are gorgeously built and appointed, with every need and convenience you can imagine (down to sunhats and sunlotion and condiments for cooking). They are spacious and comfortable and quiet, and with the patio, pool and gardens, they provide the perfect retreat from day trips around the Algarve. We have brought our baby (now toddler) twice, and he loves it, too. We cannot recommend highly enough! Had 2 wk break in Casa Helena beginning of April. Enjoyed every minute of relaxing by the pool, taking in the views, visiting local attractions. Day trip to Seville made too. Villa well equipped and clean and comfy. Mary just close by if you need anything and was a superb host leaving you to enjoy your holiday. Have recommended already to lots of family and friends and would definitely go back. Very kind of you to send a review. And delighted you enjoyed your stay. It was a pleasure meeting you & the family. We stayed in Casa Catarina for 10 nights and we had a great time. I agree with everything the other reviews have said but, as I am a bit slow, I didn’t really know what well equipped really meant. Therefore I though I would list everything I liked and didn’t like about our stay. The Villa really did have everything we needed – Hairdryer, towels (both hand, bath and beach), shampoo and soap, some tea and coffee, some really sharp knives (I’ve got the cut to prove it), washing machine and dish washer (with tables), spare shopping bags, loads of cutlery, plates, bowl etc. and allsorts of little extras – like charcoal for the BBQ. There was even a bowl of oranges and all 3 major food groups – Red, White and Beer – which was really nice welcome surprise. The local town is a little too far to walk to. The towel rail in the bathroom was too slippery. Some of the knives were too sharp! As you can see by my short and pedantic list of dislikes, it is hard to find fault. Mary and Bill where lovely hosts that really made our holiday special. The 3 Villas are set in a rural tranquil setting amidst beautiful gardens around a 10 metre swimming pool. The Villa Catarina was well equipped, rustic, with 2 terraces placed for the daytime and evening sun with views down to the sea. The owners live on site, and are available for advice and solving any problems promptly and efficiently. Rates are cheaper than the western Algarve, which has more tourism than the eastern sector, where agriculture plays a larger role. The coastal lagoons and Islands have great bird watching with Flamingoes, Spoonbills, and many other coastal birds with Storks nesting in many villages on roof tops etc. The downside is that the beaches are more difficult to access and not as attractive as in the Lagos area for example. There are several good Restaurants in the nearby town of Moncarapacho, which I reviewed separately on TripAdvisor. I highly recommend the Villa for those seeking a relaxing rural setting, comfort, but not luxury, and with good service plus an attractive price, particularly in low season. The ancient town of Tavira is 20 mins east. And the Roman site Milreu is 10 mins. west, next to the Estoi Palace, recently refurbished, stunning. A drive north into the hills is well worth while, going through Sao Bras. Or drive east to the Guadiana River and on up to Alcoutim. Or cross over to Ayamonte, Spain by ferry or bridge. Kite sailing & SUP taught nearby at Fuzeta. Archaeological sites in Estoi, Tavira & Vilamoura. Markets: Monthly Sunday markets are in Moncarapacho, Estoi, Santa Catarina, Quelfes and Olhao. Cyclists will enjoy the cycle path along the Ria Formosa, extending across the Algarve. Fish Market: Olhao has the biggest selection in the Algarve (also a smaller local fish market). Ayamonte, Spain, is a 40 min. drive, crossing the Guadiana River by bridge or very cheap ferry. Birdwatching under the bridge or at nearby Fuzeta salt pans, or Ria Formosa Reserve to see storks, flamingos, spoonbills, etc. Kite surfing in Ria Formosa is safe & excellent. There is easy access to the beautiful local beaches: Fuzeta & its island are our nearest beach & a frequent ferry takes you there in minutes. A little further east, Pedras Del Rei beach offers windsurfing & waterskiing with excellent sea food restaurants. Olhao is 5 miles south & offers boat rides along the Ria Formosa. Activities in the local community centre, Casa do Povo, includes, Scottish dancing, yoga, guitar lessons, Portuguese lessons & Sunday tea dances! Airport 30 minutes (Faro). A car is essential in this area and car hire can be arranged on request. Seville is only 1 1/2 hrs drive east. Moncarapacho is 2km east. The fishing port of Olhao is 8km south. Faro Airport is 30 mins away. Estoi, Roman Villa Rustico, Milreu, is 8km west. Tavira, the most picturesque town in the eastern Algarlve, is 20 mins drive east. We are blessed with excellent local restaurants in Moncarapacho: Colibri, Antionio's, Pizza Love, Ana's, Cortico & many Snack Bars. Virtually everything can be bought here including PG Tips. Moncarapacho has a supermarket open 7 days til 8pm. Aldi, Lidl, Pingo Doce, Intermarché & Continente are 6 miles away in Olhao. Moncarpacho Museum is small but well worth a visit. Casa do Povo has dances every Thursday evening & Sunday afternoon, as well as yoga lessons, Portuguese lessons! The social life here is plentiful & informal. Booking Notes: Three-day minimum booking. You may make a "provisional" booking whilst you find flights. 25% to owner to confirm booking & the balance 6 weeks prior to arrival.. Please request bank details. Changeover Day: Saturday, but flexible when possible. Please ask. Notes on prices: Prices are for the property per week in UK Pounds. There is a discount for 2 people only, & for late availability and cancellations. The following attractive discounts are available to people renting more than one villa during the same time period (except July, August & September). 8% off if 2 properties are rented at the same time. 10% off if 3 properties. Dogs cost £25 each per/week. WINTER RATES, from NOV. through March: £680/month + gas.